Q: Do these hats come as one or in a pack? These beanie caps come as one not per pack. A: we are expecting shipment around early to mid November. Q: When will you be restocking the white newborn hats? A: The approximate height (unfolded) is 7" and the approximate width of these infant beanie hats is 6 1/2"
Q: Do the colors in the beanie cap match the colors of the gowns? Thank you! 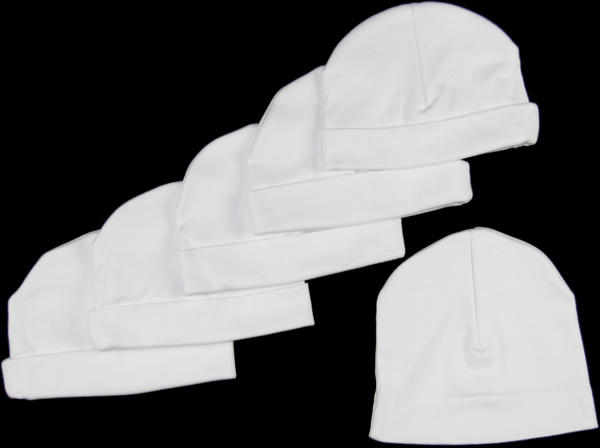 A: These beanie caps do match the layette gown (style 4706). They are the same fabric and are cut from the same rolls. There may be a slight difference from one dye lot to another as with most garments.